Sanya (三亚 Sān​yà​) is on the southernmost point of China, at the tip of Hainan island. Sanya Wan beach at night time. Hainan locals and mainland tourists relaxing and enjoying the atmosphere. With sunshine all year around, temperatures hover around 25*C even in January and 30*C in the summer time. Its islands and beaches are beautiful and the water in Yalong Bay and Dadonghai are clean enough to have a good swim, but you may also want to head to Wuzhizhou Island or further north to visit unspoiled and natural scenery. While tourists come in every season, the peak season starts from 1 October to the end of winter. During the winter, Sanya is a popular escape for Russians who primarily stay at Dadong Hai (大东海 Dàdōng hǎi) and Northern Chinese to escape freezing weather. In the Chinese New Year, the city will be flooded with tourists and expect everything to be extremely expensive. As the southernmost city in China, Sanya along with Yangshuo often serves as the last stop for backpackers who wish to spend the remaining days of their visa in China. Sanya Bay Beach - stretches around 25 kilometers, but being a public beach it can get very crowded and dirty in particular during CNY and other peak seasons. It is lined with seafood restaurants and both local and international hotels. Sanya city - a rapidly evolving city, struggling to keep up with the pace of its development. The main streets can be an assault to the senses with scooters ignoring red lights, buses, cars and taxis beeping and pedestrians competing to get ahead. Locals seem unfazed by all the commotion and are warm and friendly if you make a little effort. You will see locals dancing along the beach in the evenings, and a range of people selling souvenirs, street food and fairground games. A must visit is the #1 Market, checkout the fresh local produce, kitchen/homewares, seafood and even pearl vendors. In the evening cross the Sanya River (三亚河 Sānyà hé) to reach a less touristy, cheaper, and fun part of town. Times Coast complex is lined with lively KTV lounges, bars and dance clubs. DadongHai (大东海 Dàdōng hǎi) - Sanya visitors favorite meeting place, it has a good range of stand alone restaurants, cafés and bars. The bars along the beach are lively and cater for both Chinese and foreigners, particularly Russian tourists. Summer Mall, is the place to go for imported food products, but expect to pay higher prices. Serenity Coast (Banshanbandao) - Extensive residential and resort complex with several international hotels, a world-class yacht club, Luihuito Golf Course, and the Sanya International School complex opened 2014, please note it is no longer affiliated with the Canadian International School . Yalong Bay (亚龙湾 Yàlóng wān) - is a 7.5 kilometer stretch of beach, located 40 minutes from the airport and easily accessible on the high speed train, via Yalong Bay station. The area has been developed into a high end holiday destination with luxury resorts, golf courses, restaurants, and a new marina. The beach is well maintained and attracts high profile guests and residents. Definitely worth a visit, but be prepared for pay a premium compared to other parts of Sanya. Haitang Bay (Hǎitáng Wān) - An up and coming development covering 42.8 kilometers of beach. This area has many international hotels slated to open in the next few years. It is 35 minutes away from Phoenix International airport by G98 Highway, and is home of the largest duty free shopping mall in China. Several luxurious resorts of note are already operating as well as a multiplex and show center. Sanya has an airport with flights to most major Chinese cities such as Guangzhou, Shanghai and internationally Taipei, Hong Kong, London, Singapore, Busan, Kuala Lumpur, Penang, Ho Chi Min City, Seoul, Bangkok and Kuala Lumpur. Fares vary significantly, as some flights are seasonal charter air routes. You may be able to get some flexibility by taking a bullet train to Haikou and flying out of the provincial capital's larger airport. The Meilan high-speed rail station is in the same building complex with Haikou's international airport. For intercity bus, ticket and overnight lodging can exceed the difference and you should account for travelling 3-4 hours each direction. In addition to the bus, you will easily be able to find "heiche" (黑车 hēichē) taxis that will take you between the two cities, for between 350 and 500 yuan per car. Although strictly illegal, you can find drivers that are courteous, safe and reliable, although this is much more difficult without being able to speak at least basic Chinese. To get into Sanya city, take bus no 8 from the airport, which goes to Jiefang road and #1 market. Fare is 5 yuan, pay in cash directly to the conductor on the bus. There are several bus routes from the airport, check with your hotel for the right one. The 3.5 hour bus ride from Haikou East Bus Station will cost about ¥80(takes around 4 hours). Buses between Haikou and Sanya depart about every 30 minutes; the last bus from Sanya to Haikou departs around 11PM. Sanya's bus station is along Jie Fang Lu (解放路 jiěfàng lù), a few steps south (away from McDonalds) of the east end of "Shopping Street" (步行街 bùxíng jiē). Sanya can be reached directly by train from Beijing (35 hours), Shanghai (36 hours) and Guangzhou (15 hours). The whole train is loaded on to a ferry for the journey from mainland China to the Island, then continues its journey around the west coast as far as Sanya. As trains leaving the island originate in Sanya, tickets from this smaller town are easier to obtain than if leaving from Haikou. High-speed train connect all major cities and towns on the eastern coast. It takes 1.5 to 2 hours from Haikou, travels up to 250 km/h. There is a stop at Yalong Bay, Sanya, and Phoenix Airport. Be careful to check the service is stopping at your desired station, there are many express trains. The new train station in Sanya is far from downtown, approximately as far as the airport. A taxi to Dadong Hai (大东海), the most popular tourist area) is approximately ¥25-30. A public bus will cost ¥1. Lines 2 and 4 lead through Sanya city proper and continue through (and past) Dadong Hai. Many people stay in beach areas with more-or-less everything within walking distance. Darting in, around, and between Sanya city and Dadong Hai is best done by the city bus lines 2 (fastest) or 4 (adds some stops around Sanya River) for ¥1. The buses run along Sanya city's Jiefang Road (解放路), which is the street McDonald's is on, and hit Dadong Bay at Luling Road (鹿岭路), just one stop past the Deer Turns Head Square (鹿回头广场). Taxi fare starts from ¥8 for the first 2 kilometers, and ¥2 for each additional kilometer. Due to the cheap fare, taxi drivers like to hover around anywhere outside the downtown to avoid short-ride passengers. This makes getting a taxi in the downtown a bit difficult. Taxis are quite well regulated and they are mostly okay with using a meter, but drivers are mainly immigrant workers who may not be familiar with every place. Some of them also try to fool tourists that the place they want to go is closed, and try to take you farther. Another problem is that since Sanya is only crowded during winter, there are enough taxis to go around. And the government doesn't hire more taxis because during the summer, there would be too many taxis and the drivers would not make any money. To help with this problem, the government has commissioned another class of yellow taxis that can hailed by phone. Dial 96789 tell them your location and they will pick you up if there is a car nearby you and the rates are the same as regular taxis. During peak season they might add ¥5 to your fare. There are also numerous motorcycle and sidecar taxis. You must negotiate the price before leaving. Prices are slightly lower then regulated taxis but it depends on your negotiating skills and knowing what the locals pay for the same trip distance. For trips farther out of town, you can buy bus tickets at Sanya city's bus station or just hail buses on the road that runs along Sanya's beach. Tickets to most destinations will be ¥1-30. You could also hire a van with (or without) an English speaking guide from hotels or people with white and blue displays on the streets of Sanya City or Dadong Bay. If choosing to go with a Chinese tour group, beware that there may likely be several hours of scheduled stops at "infomercial" centers, complete with microphone delivered advertisements. You can also rent an electric motorbike or a car of your own. There are several places to do this, One service provider is called TAILG, address is around #130 on Jiefang St. Prices: for an electric bike ¥50 per day (¥1800 refundable deposit, no driving license needed); for a car prices vary depending on the model. Petrol motorbikes are almost impossible to rent in Sanya. However, any driver who is not familiar with the traffic norms in Sanya should think twice about renting a motorbike. Traffic rules are practiced half-heartedly and road condition can be dangerous even if you are a good disciplined driver. When you crash into a pedestrian, you as a driver are likely the one to pay the compensation. Also electric motorbikes may need frequent recharging if the battery is in poor condition. When renting a car or petrol motorcycle, you need a valid chinese driving licence (International Licenses are not valid). There is no exemption to this rule and you can be jailed for up to 15 days by driving without a license. In most cases, you will be fine without it, but in the event of an accident, this will be a major issue. If renting an electric motorbike, no driving license is required. Ease in to island life with a spa treatment at one of the many award winning venues in Sanya. Please note visiting a spa, like most things in Sanya, is not for the budget conscious. You are looking at a starting price of 400RMB for a basic massage, but with the beautiful settings and well trained therapists you don't want to miss out on indulging at least once. Some visitors book treatments before hotel checkin if they arrive on an early flight before their room becomes available or after the check out to give them a relaxing way to kill time before heading back home, this is by far the best option as there isn't much to do at the airport. You must book in advance, walkins are not very common. Charter a private air tour of Hainan. Sanya is home to numerous world class golf courses, suitable for beginners and several demanding golf courses for more experienced players. International tournaments are regularly hosted in Sanya golfing venues. Hotels can offer weekly packages where you can golf every day on a different course. Hainan is China's only destination with consistent, year round surf. 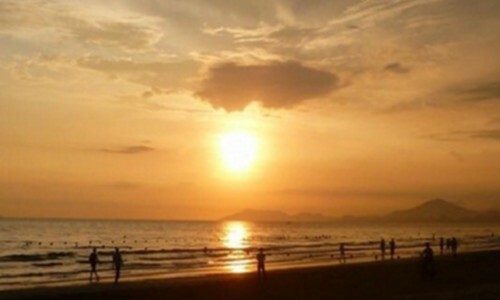 In the summer, the south winds bring waves to Sanya's south-facing beaches. In the fall through winter, the peak surf season, Hainan's east coast is the place to go. Hainan does not offer world-class waves, but it offers fairly consistent tropical surf, which is almost completely empty. If you are new to surfing, there are a number of companies to contact. Sanya is a popular destination for pro-amateur bikers who are eager to hover around the whole island. However, almost all bikers take their own bike. Bike rental service is not as omnipresent as other touristy places such as Yangshuo or Lijiang. Most bike shops are located at Sanya Hexi Lu (Sanya River East Road), you need to pay Y1000 for deposit and prices start from Y40 for 1 day hiring. Several hostels also have a bike rental service. A route from Dadonghai to Yalong bay, then to Haitong Bay has a well-constructed, -lit and smooth road which stretches over 30KM and make it ideal to ride. However, the urban area of Sanya has some of the worst traffic in China and the local police are notorious for being impotent on cracking down traffic violations. Yalong Bay, Dadong Bay, Haitang Bay and Sanya Bay all have a collection of jet skiing, parasailing, paragliding, snorkeling, scuba diving, glass-bottomed boat, and beach ATV enterprises. Prices aren't generally very negotiable (save for scuba and snorkeling), but duration of the ride, however, can. Do not go too cheap on scuba, for obvious safety reasons. the only certified PADI is located at the Serenity Coast marina. In Sanya, you may more likely do more walking than hiking. With its pretty flat landscape and well-developed roads, hiking is not particular popular among tourists. Hikers often take a bus in the Sanya Bus Station at Jiefang Road and head to Wuzhishan (五指山）to start their hiking tour. The 90-minute bus is available every hour from 7:00 to 16:00 and fare is around Y16. With such a beautiful environment, relaxing on the beach and studying Mandarin Chinese is a fun and productive activity for those with more time. It's also easier to focus on the studying without the distractions of the big cities. The area produces pearls in abundance and they are sold everywhere. Prices are highly negotiable; overcharging tourists is common. Tour guides get a fat (often 50%!) commission for bringing tourists to pearl shops; try to go without one and beat the price down. Coconut powders and teas are also popular Chinese buys, but for Westerners looking for something less commercially produced... the cone-shaped hats that women wear here with pictures inscribed are only 5 RMB at The First Market (第一市场 dìyī shìchǎng) in Sanya city. Lines 2 and 4 have a stop there. Don't head into the department store; instead, stick to the side of it and walk down the road filled with small shops and street vendors. There are plenty of good restaurants, including many Sichuan places and some Cantonese. There are two McDonald's (Pineapple Mall Dadonghai & on pedestrian street at Jiefang Erlu) Several Burger Kings (JieFang Lu, La Floret Yalong Bay, Domestic Airport Sanya) and four branches of KFC (105 Jiefang Lu; Duojialian; 63 Guoxing Dadao; Renmin Lu). Seafood is a beach city's speciality. Inspect the tanks for freshness before eating and beware of the different charges that are often handled by different people at the restaurant (fishery, cooking fee, and sitting fee can be separate). Shellfish go for ¥10-25 per jin (half kilo). Hainan is famous for Wenchang chicken or Haianese Chicken Rice, only chickens raised in Hainan province can genuinely be called as such. The accruements are usually: ginger, vinegar, soy sauce all served along a small portion of rice and chicken broth. Hainan grows a great variety of tropical fruits. Mango, betel nut, pineapples, durian, jackfruit, mangosteen, lycee are very popular. Hainan is famous throughout China for its coconuts and they are worth trying, especially the red coconuts (红椰 hóng yē). Away from the beach, expect to pay about ¥4-5 for a coconut. Prices increase as you get closer and you may end up paying about ¥15 for a coconut on the beach. Note that fruit price is fluctuating and cheating on its weight is common. Visit any big and well-established chain supermarkets such as Wan Hao or Nan Guo in the downtown of Sanya along Jiefang Road to check the current market price. A bit after sunset and well in to the midnight, Sanya city's streets are filled with small barbecue stands, noodle stands, and other snack vendors. There is a well-known seafood supermarket called The No. 1 Agricultural Products Market(第一市场)(See address below). You buy live seafood and then take it around the corner to a crowded street where all the restaurants will cook (Jia Gong,加工) the seafood for you for a small fee per dish. It's the most crowded night market in Sanya. You will find a constant assortment of musicians and kids that sell flowers to proposition you while you are eating. It's a great way to save money on eating seafood because there is no markup for the seafood because you purchased the seafood yourself. It's quite a lively environment with guitarists playing, saxophonists playing, customers singing, beer flowing all night long, garbage trucks to come by to pick up the garbage, and the occasional fight. This street starts dying down around the midnight and the crowds head to bar street. After Bar Street closes, the crowds head to the night food market located at the 1st Lane of Shangping Road (商品街一巷) which is close to Jiefang Road (解放路). Most foods are at the fixed price but try to negotiate a bit for the seafood barbecue. The food and beer flows until the sun comes up. Another popular after-hours barbecue place is at Wan Jun Long. Not as popular as Shangping Road, but somewhere different. Night markets in Dadonghai are less impressive, but local people likely head to Xia Yang Tian(下洋田) for some quick and simple food which is usually cheap. Coffee The vast majority of coffee shops here open around 10 or 11AM. This is where all the hottest clubs in Sanya are, it's one big circle with about 10-11 clubs. The big three first tier clubs with all the tourists are Soho, MJ, and 88. The rest of the clubs are second tier clubs that have mostly locals and are less expensive. To get here, hop in a cab and say "Jiu Ba Jie". The most popular local brew is Anchor (actually Singaporean but produced in Hainan). Ask for the 'red label' or 'old' brew, which is the original. It is very hoppy and can be a great escape from Yanjing (燕京) or Qingdao (青岛) beer. Those are available, of course, as well. There are also local pineapple-based beers. Odd, but worth a try. Red coconuts (红椰) are especially sweet, even if you just pop a straw straight into the coconut! 阳光地带 (Yang Guang Di Dai), 520 解放路，4th Floor (Across the street from McDonald's, In the building that says New York Studio or something like that, take the elevator to the 4th floor). close 2am. This is where all the Gay and Lesbian people in Sanya hang out. You will find the men in one corner and all the women in another corner. Most of the women have short hair. They sell Anchor beer. There is a wireless microphone and you can sing karaoke. You can pick the songs yourself from the computer. If you are a good looking male, you will get hit on. ¥120 12 beers. In Sanya city and Dadonghai there are many small, clean moderately priced inns and hotels (¥50-100, even in high season, for 1-3 beds). Some may be located in alley ways just off Sanya's beach street, sometimes several floors up without an elevator (but the view is worth it!). As a newly developed tourist destination, Sanya exists solely for tourism which is accompanied by annoyances including pickpocketeting and overcharging. Before arrival, travelers should be wary of getting the right address and most up to date telephone number for their hostels/hotels. Some hostels are located in a new district whose roads have just been laid out. Not many people, including the police, know where specific locations are in new districts. When you get lost, always ask drivers to call the staff. Para-sailing, diving, snorkeling and boating are popular but operators may not be trained or certified. If you go for diving, always check air tank pressures before. Some Wikitravelers have reported that they received half-empty scuba tanks and found it difficult to inhale smoothly. Sanya has a lot of local tour packages. Some tours to outlying islands may look cheap, but once you arrive on the spot, operators may charge you extra money for using their equipment. Masks, snorkels and fishing rods can be shabby and expensive to rent. Other tours are shopping traps, complete with ridiculous commissions for the tour guide. Before you join any tour, ask specifically what is included in the fee (beach chair, drinks, boat, fishing rod, snorkel, mask, transportation, admission fees, return transportation, etc), and what is not (shopping). Thanks to a heavy crackdown on gangsters, Sanya has become much safer than in the early 2000s. While violent crimes against tourists are rare in Sanya, be wary of pickpocketing, bicycle theft and bag snatching. There are occasional reports of professional drivers zooming alongside a tourist and grabbing their bag. Pickpocketing is common on buses. You should avoid bringing any valuables to the beach as theft is occasionally reported. Note that lockers on the beach, along their showers and beach chairs, are NOT free. They will charge Y20 to Y50, or more, per use. Sanya is also notorious for overcharging. Scams in seafood restaurants were heavily reported in the Chinese media in 2011. To avoid very unpleasant sticker shock, make sure you know the price of what you are ordering. That being said, as a tourist area, everything sold close to the beach will be 30%-100% more expensive than in downtown Sanya due to high rents and the law of supply and demand (lots of tourists, limited prime real estate for restaurants). Furthermore, market prices anywhere in Sanya are slightly higher than Haikou due to the cost of transportation. For seafood lovers who just traveled from inexpensive Haikou, do not expect to pay Y10 for 4 scallops or 6 oysters. Traffic rules apparently do not exist. Cars and motorcycles drive on both sides of the road and careen down sidewalks as if they had right of way. Irritating honking is ever-present, even when driving on sidewalks. Tourists should NOT trust the green traffic light and zebra crossings, because changing lights sometimes encourage drivers to speed up. As elsewhere, do not trust drivers to avoid you; you should always avoid them. Cars will only stop at red lights. Bikes will only stop at red traffic lights if they are managed by police, otherwise you will watch them zip and weave though all directions of oncoming traffic. The road dividers on main arterial roads are not there to stop people from running across; they are in place to stop cars from going down the wrong side of the road. Watch a road without these installed and you will see this in practice. The tap water, even in nice hotels, should not be considered safe to drink as the tap water in Sanya is generally not potable. Bring or buy bottled water if you plan to be outside of your accommodations for long periods of time. If you have access to a kettle in your hotel room or rented apartment, boiled water is fine to drink. Hainan is considered an active malaria and dengue fever region. Note that while there are pills to prevent malaria, there is no way to grow antibodies against dengue fever. If you plan to visit tropical forest zones, bring your own strong mosquito repellent and coil incense. While most tourists visit Hainan for the increasingly vibrant city of Sanya, the island is large and has many other more remote locations to see. The eastern coast, between Sanya and Haikou is home to Shimei Bay (石梅湾 shí méi wān) and Riyuewan (日月湾 rìyuè wān), the former which hosts the large and very secluded-feeling Le Meridien, and the latter which has become a popular spot for surfers on a budget. The cheaper hotel is Y480 a night, so not super budget. Take the slow (non-express) bus to Haikou from the bus station and ask to be dropped off at the respective highway turnoff (Y30, 90min, pay on the bus). Make sure you show them your ticket first or they will take you to another town where a taxi ride back 5 KM they charge Y100. To get back, walk up to the highway and flag down a bus. Note that express buses won't stop to pick you up. A taxi to either location will cost around Y300. Sanya Daily Life Life in Sanya and latest news in English. This page was last edited on 13 July 2018, at 12:06.